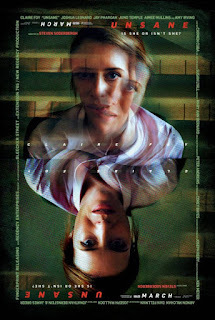 Home » Past Screenings » UNSANE Advance Screening Passes! Do you want to see UNSANE before anyone else? Learn how you can see an Advance Screening to see it before anyone else. Making a startling trip into thriller territory with UNSANE, director Steven Soderbergh (Logan Lucky, Oceans Eleven) plunges audiences into the suspense and drama of a resilient woman’s (Claire Foy, The Crown) fight to reclaim her freedom even as she risks her own sanity. UNSANE is in theaters on March 23rd, 2018. NO PURCHASE NECESSARY. SEATING IS LIMITED, SO ARRIVE EARLY. PASS DOES NOT GUARANTEE A SEAT AT THE SCREENING. Refer to screening pass for further restrictions.